THE SPIRIT OF THE NORTH Join Viking on this truly illuminating cruise and experience a land where dawn and twilight merge on the edges of the long Arctic night. Cruise far north in Norway’s winter and witness some of Europe’s most magnificent natural beauty; wondrous snow-dusted landscapes and the luminous aurora borealis dancing in the sky. Complete your journey in the historic city of Bergen encircled by majestic mountains, fjords and glaciers. Arrive in Tilbury, a historic town on the north bank of the Thames River. Settle in to your veranda stateroom and take time to explore your ship, perhaps enjoying a proper English tea in the Wintergarden. The North Sea has long been central to Europe’s history. From Viking settlement and medieval trade to international war and modern-day oil production, some of the continent’s most pivotal moments have unfolded on its stage. Learn more about this body of water during an enriching lecture. Relax on board with tea in the Wintergarden or find your inner calm with yoga on the Sports Deck. From the heart of the Old Town, where your ship berths, you will have the morning and early afternoon to explore. Start here in the old quarter, Gamle Stavanger, which has Europe’s highest concentration of wooden buildings from the 17th and 18th centuries. Or consider a cruise along the Lysefjord to see the famous Preikestolen, or Pulpit Rock, jutting out nearly 2,000 feet above—it is one of Norway’s most famous natural attractions. Offshore oil drilling is an important industry for the local economy, and the award-winning Norwegian Petroleum Museum tells the story of the dangers faced in extracting this precious fuel. While ashore, don’t forget to indulge in waffles with cream and sweet jams with a steaming cup of hot tea. As you cruise to our next port, spend the day savoring the amenities of your elegant ship. Indulge in Nordic-inspired treatments at The Spa or find your inner calm with some yoga on the Sports Deck. Tonight, dine on thoughtfully prepared cuisine that connects you to the flavors of Scandinavia and end your evening with a nightcap at Torshavn. Explore the lovely city of Bodø today, home to a masterful cathedral. Bodø lies just north of the Arctic Circle, and was rebuilt to what you see today after its destruction in World War II. On an included tour, see the Customs House, Norwegian Aviation Museum and Gothic Bodø Cathedral with its ten glorious tapestries from Nordlund and detached steeple. Its melodious church bells ring out over the town every hour. Rønvikfjellet mountain affords magnificent views over snow-covered roofs. Bodø’s greatest natural landmark, the Saltstraumen maelstrom, can be viewed year-round. Enjoy the lovely setting of Tromsø’s historic center, spread over a scenic island surrounded by snowcapped peaks. On an included tour along heated sidewalks, installed to keep the snow at bay, admire its blend of wooden structures and neoclassical buildings. You’ll see the stunning Arctic Cathedral with its striking triangular shape, the city’s most recognizable symbol. In winter, the spectacular surroundings can be explored by sled, pulled by reindeer or dogs. You can learn about this long-held wintertime tradition at the Tromsø Wilderness Center, home to more than 100 huskies. Enjoy another day to immerse yourself in the natural beauty and rich culture of Tromsø. You might set off into Norway’s pristine wilderness on a glacier trek in the Alps. Alternately, learn about the aurora borealis and the indigenous cultures of northern Norway from experts at the Tromsø University Museum. Or pay a visit to the world’s northernmost brewery. Resting on the stunning shores of Altafjord, Alta is the gateway to some of Europe’s most magnificent natural beauty. Its frequent clear skies make it an ideal locale from which to view the northern lights. In Alta, fascinating rock carvings tell stories of primitive cultures; you may view them, as well as fascinating exhibits on salmon fishing and the northern lights, at the excellent Alta Museum. Or you may opt to visit the nearby Sami community of Máze for an authentic lunch of local dishes and an exciting ride in a reindeer-drawn sleigh. Enjoy another day amid the breathtaking setting of Alta. You may wish to explore the town on your own, perhaps visiting the Northern Lights Cathedral. Admire its fascinating steeple designed to resemble a flame and enjoy the ethereal strains of its organ. Or venture to the spectacular Sautso, a canyon carved over millennia by the Alta River. 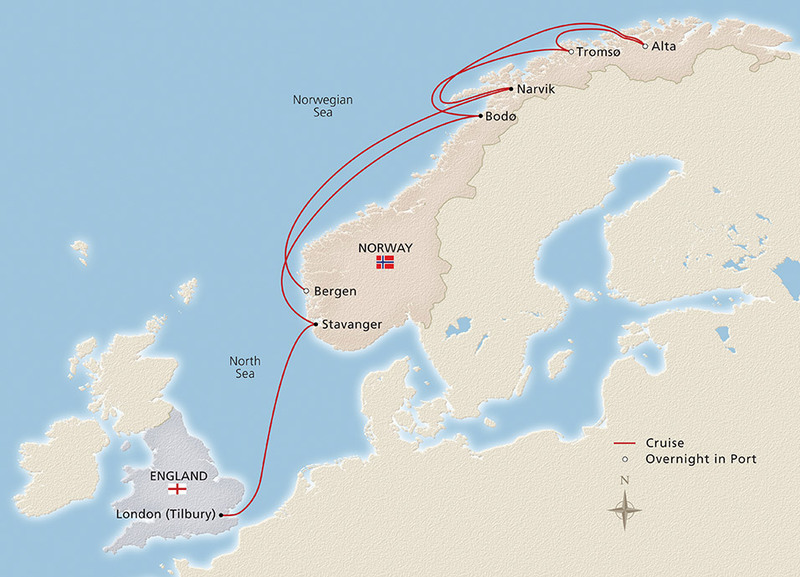 At 7.5 miles long and up to 1,380 feet deep, it is the largest in Northern Europe. Home to a former Viking settlement, Narvik is situated on the innermost shores of the Ofotfjorden. The small town enjoys a dramatic backdrop, encircled by mountains in every direction and the glacier that spills right to the water’s edge. During your visit, you will learn how the ice-free port helped the town prosper as an exporter of Swedish iron ore. At the Polar Park, you can view some of the residents of the far north, including Arctic wolves. You might also enjoy the wilderness during a sleigh ride or meet the native Sami people. As you sail the scenic coast of Norway, delve into the Nordic-inspired amenities of your ship. Treat yourself to a traditional Norwegian waffle at Mamsen’s gourmet deli. Tour your ship with our Viking Art App installed on your mobile device, learning about the onboard Scandinavian-inspired art and streamlined design. This evening, savor a romantic dinner at Manfredi’s Italian Restaurant. Encircled by majestic mountains, fjords and glaciers, Bergen was home to Viking sagas. With your ship berthed next to Bryggen wharf, a UNESCO Site, easily stroll along its waterfront. See the beautiful 18th-century wooden houses, and visit the Hanseatic Museum on your included tour. Perhaps take an excursion to Troldhaugen, the home of Edvard Grieg, Norway’s famous composer. Or take a trip to the top of Mt. Ulriken, where you can savor an Ulriken bun, a cinnamon pastry, with a view that is equally as indulgent. Gain an insider’s view of Norway’s shipbuilding culture and fish farming industry on our optional excursion. This evening, dine ashore and mingle with the locals, as we will be spending the night in port. Awake in Bergen, where you will be departing your ship. If you wish, you may explore more with Viking: Stay on in this fascinating old mercantile city, visit Norway’s cosmopolitan capital of Oslo or journey to Iceland. Please note: Price shown is in AU$, based on low season travel in a Veranda (V2) stateroom. Many upgrade options are available - prices on application.